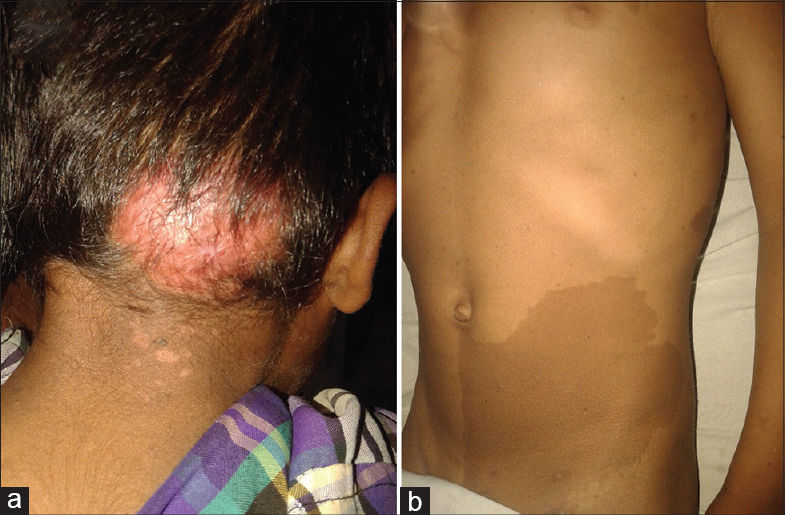 Plexiform neurofibroma (PNF) of the scalp is an extremely rare lesion reported in association with neurofibromatosis (NF). Occipital location of PNF is even more infrequent; we reported one pediatric case of PNF in occipito-cervical region with multiple small occipital bone defects and associated with NF-1. Infantile tremor syndrome (ITS) is defined by the tetrad of pallor, developmental delay/regression, skin pigmentation, and brown scanty scalp hair. Involuntary movements in the form of tremors supervene in the natural course of the illness in a significant number of cases. The disorder occurs in exclusively breast-fed infants of vegetarian mothers belonging to economically deprived sections of society. Most of the children eventually recover but are frequently left with long-term cognitive and language neurodeficits. ITS continues to be seen in clinical practice, but there has been no consensus on its causation. Last comprehensive review was published in 1987 describing the ITS as a syndrome of unknown or multiple etiologies. Several important papers have been published since then. This review attempts to provide comprehensive and up-to-date information on the subject incorporating recently published studies. In the end, the issue of etiology is objectively re-examined in the light of available evidence some of which has been published in recent years. Objective: To study the role of Vitamin B12 as an etiological factor in patients of infantile tremor syndrome (ITS). Methods: Twelve consecutive admissions of children diagnosed clinically as ITS were assessed. Assessment was done using a predefined pro forma to document patient demographic factors, general examination, systemic examination as well as relevant hematological and biochemical investigations. Results: Out of the 12 cases of ITS, 6 were males and 6 were females. Two cases had serum B12 levels below reference values, five had levels in low normal range, and remaining five had normal values. Conclusions: Role of Vitamin B12 deficiency as an etiological factor in the patients of ITS is inconclusive. Background: The values of electroencephalography (EEG) in neonatal hypoxic-ischemic encephalopathy (HIE) during therapeutic hypothermia (TH) are still uncertain. Aims: The aim of this study is to detect EEG background, the prevalence of seizures during cooling, and to determine different EEG patterns that can predict brain injury in magnetic resonance imaging (MRI). Patients and Methods: Thirty-nine newborns with HIE were subjected to TH. Continuous monitoring by video-EEG was carried out throughout cooling and during rewarming. MRI was done for all newborns after rewarming. The predictive value of EEG background for MRI brain injury was evaluated at 6-h intervals during cooling and rewarming. Results: At all-time intervals, normal EEG was associated with no or mild MRI brain injury. At the beginning of cooling, normal background was more predictive of a favorable MRI outcome than at later time points. After 24 h of monitoring, diffuse burst suppression and depressed patterns had the greatest prognostic value. In most patients, a discontinuous pattern was not associated with poor prognosis. Thirty-one percent developed electrical seizures, and 8% developed status epilepticus. Seizures were subclinical in 42%. There is a significant association between duration of seizure patterns detected on the EEG and severity of brain injury on MRI. Conclusions: Continuous EEG monitoring in newborns with HIE under cooling has a prognostic value about early MRI brain injury and identifies electrographic seizures, approximately 50% of which are subclinical. Treatment of clinical and subclinical seizure results in a reduction of the total duration of seizure pattern supports the hypothesis that subclinical seizures should be treated. Literature on the association of methylphenidate and obsessive-compulsive symptoms (OCS) is sparse. This report discusses a case of a 14-year-old boy, who developed OCS (in the form of need for symmetry, obsessive doubts; compulsive symptoms included the need to order/arrange articles and repeated checking behavior), within 10 days of starting methylphenidate at the dose of 15 mg/day. Stoppage of methylphenidate led to amelioration of OCS over 2 weeks. The case description suggests that whenever a child on stimulants presents with new-onset OCS, association of OCS with stimulants must be suspected before considering an independent diagnosis of comorbid OCS/obsessive-compulsive disorder. Spinal schwannomas are commonly intradural extramedullary in location. As Schwann cells are not common in the central nervous system, intramedullary schwannomas are a rare entity. In adults, an estimated sixty cases have been reported in English literature. They are rarer in children (less than ten cases), and preoperative diagnosis becomes a prerogative in achieving total excision. Cervical cord is a common location and less commonly they occur in the conus. 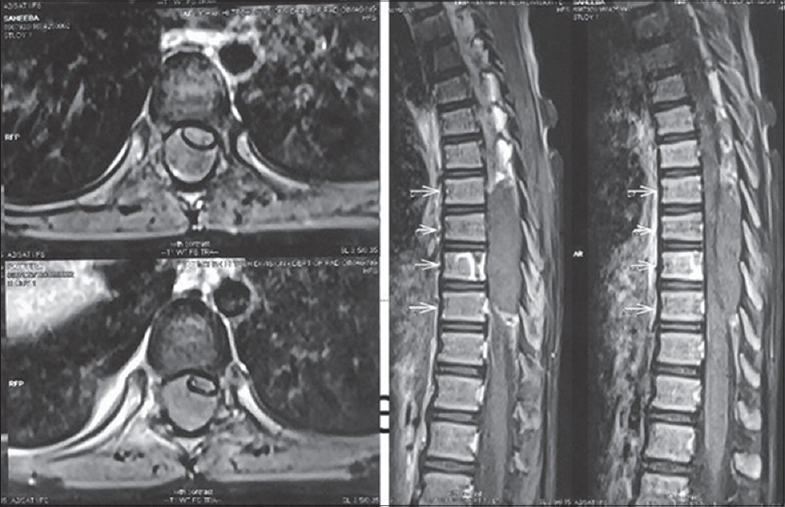 We report a rare case of calcified conus intramedullary schwannoma in a child without neurofibromatosis, who presented with conus-cauda syndrome of 1-year duration. Literature has been reviewed regarding its origin, pathophysiology, radiological features, and surgical management. This child underwent laminotomy and subtotal resection of the lesion. Histopathologically, tumor had typical features of schwannoma and was positive for S-100 immunoperoxidase. We believe that schwannoma needs to be considered in the preoperative differential diagnosis of a conus tumor in children as complete excision is possible in these benign tumors, thus affecting a cure. Guillain–Barre syndrome (GBS) is the most common cause of acute flaccid paralysis worldwide both in adult and pediatric population. Although flaccid paralysis is the hallmark of this disease, there are some rare variants which may be easily missed unless suspected. Here, we present a very rare variant of GBS - acute bulbar palsy plus syndrome in a pediatric patient. 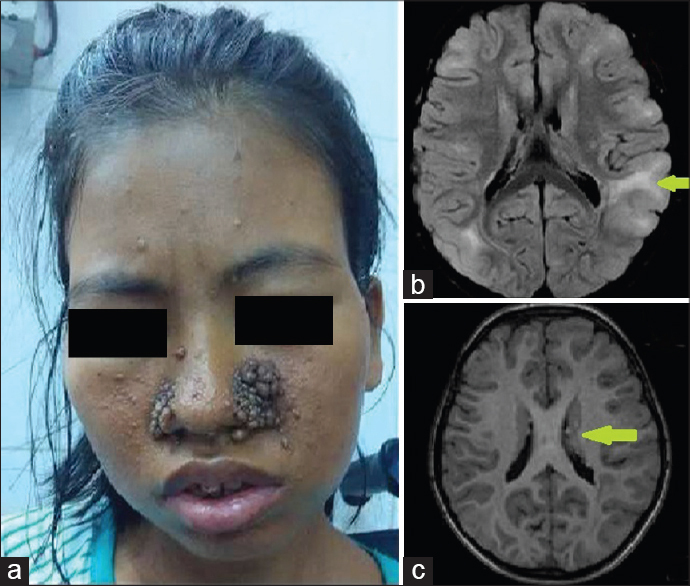 A 13-year-old female child presented with right-sided lower motor neuron type of facial palsy and palsy of bilateral glossopharyngeal and vagus nerve of 2 weeks duration. On detailed neurological examination, motor and sensory system were normal, but the deep tendon reflexes were absent universally. Nerve conduction study showed demyelinating motor neuropathy. Based on typical clinical course and electrophysiological studies, the diagnosis was made. To the best of our knowledge, this is the first pediatric case of unilateral facial palsy with bulbar involvement without any motor abnormality. Ependymoma tends to occur commonly along either on ventricular surfaces of the brain or central canal of the spinal cord. Rarely, ependymoma can develop in the cerebral cortex without attachment to the ventricular structures. However, such occurrence in the purely extra-axial compartment in the falcine region mimicking falcine meningioma is exceedingly rare. The detailed search of primary falcine ependymoma (PEFE) in Medline and PubMed yielded only five isolated case reports. All cases occurred in patient older than 17 years of age; however, our case was a 9-year-old girl. PEFE tends to occur more commonly in male with a male to female ratio of 3:2, with the mean age of 28.8 years (range 17–43 years), lesion had intra-operatively had solid consistency in all cases. All cases were subjected to surgical resection followed by adjuvant radiotherapy; however, in addition, one case also received chemotherapy, with an average follow-up period of 9 months, however, missing in one case. The mean size of the tumor was 5.25 cm (range 1.8–7.2 cm). The authors present a unique case of PEFE in a 9-year-old girl with 8.6 cm ×6 cm ×5.4 cm-sized giant primary falcine ependymoma, managed surgically successfully. To the best of the authors' knowledge, the current case is the first case of pediatric extra-axial falcine ependymoma occurring within the first decade of life in the western literature, showing rapid evolution over 1½ month's period into a giant size. Brief pathogenesis, clinical feature, and management along with the pertinent literature are reviewed briefly. 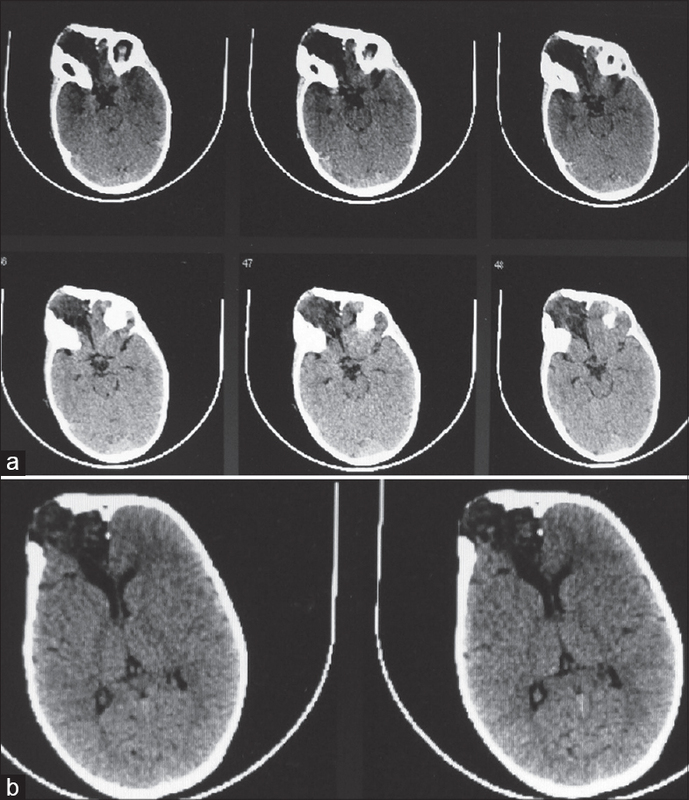 A previously healthy 1-year-old child with a traumatic acute subdural hemorrhage received 10 times higher dose of hypertonic saline inadvertently immediately before surgery. This case report describes deviations in fluid management needed to alleviate salt toxicity and its adverse effects during surgery under anesthesia perioperatively. The child made an uneventful recovery with no evident residual damage at follow-up. With only 33 cases reported so far, a purely extra-axial position of medulloblastoma at cerebellopontine (CP) angle is quite exceptional. We report a case of extra-axial medulloblastoma in a 15-year-old male child located in the CP angle that was surgically treated with a provisional diagnosis of schwannoma. Histopathological diagnosis of medulloblastoma was made with the routine hematoxylin and eosin stain and immunohistochemical markers. 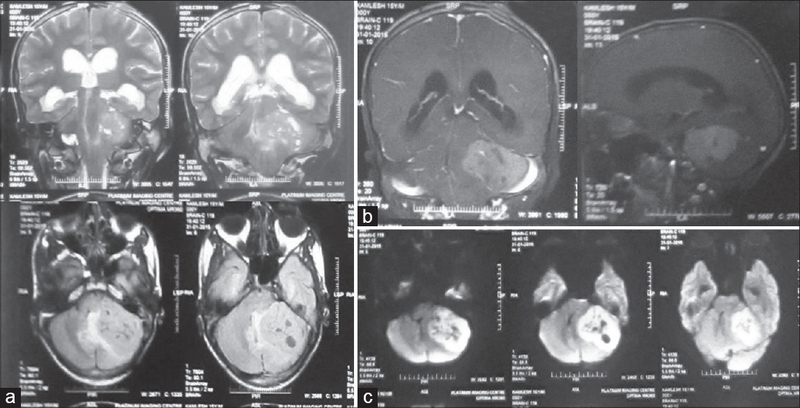 This case report highlights the fact that although extremely rare, the possibility of an extra-axial mass being a medulloblastoma does exist. Stridor is a serious complication of congenital neuraxial anomalies, which though, can get completely resolved with early neurosurgical correction of the anomaly. However, stridor relief may or may not be achieved soon after surgery. Persistent postoperative stridor can potentially cause extubation failure that may be difficult to handle in small children. There are no extubation guidelines for difficult pediatric airways as yet, and fewer appropriate airway-assist devices for routine use. Management of an infant with occipital encephalocele, hydrocephalus and bilateral abductor vocal cord palsy, who developed post-extubation respiratory distress due to stridor is discussed, together with the relevant tracheal extubation issues in such cases. Childhood primary angiitis of the central nervous system (cPACNS) is a rare and a potentially fatal cause of childhood stroke. The disease poses a diagnostic dilemma for the clinicians due to overlapping and varied clinical manifestations such as headache, focal acute neurological deficits, cognitive impairment, or encephalopathy. 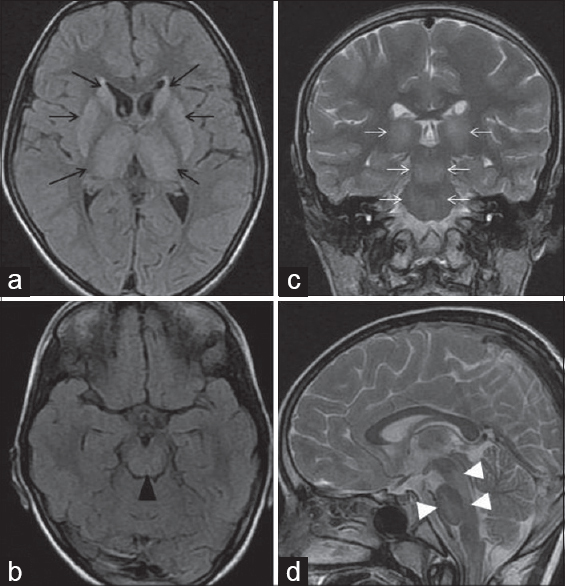 We report a young boy who presented with low-grade fever and headache but rapidly progressed to develop acute encephalopathy and quadriparesis with multiple cranial nerve palsies, masquerading as acute disseminated encephalomyelitis. The neuroimaging was suggestive of vasculitis. He was diagnosed as cPACNS and recovered with immunosuppressive therapy. Fracture of the anterior skull base can occur following head injury. Growing skull fracture is usually observed in children under age of 3-years. It commonly involves frontal and parietal regions. However, orbit involvement is extremely uncommon. 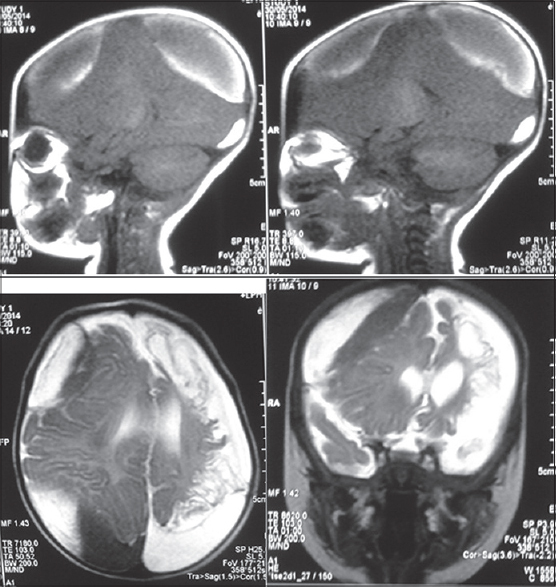 Authors report a case of giant orbital encephalocele with a forehead disfiguring swelling in a 4-years boy, who sustained head injury about 3½ years back. However, such delayed presentation of traumatic encephalocele is extremely uncommon and represents the first case in the Western literature, who had a successful postoperative outcome. Association of Dandy–Walker syndrome with occipital meningocele (OMC) is extremely rare and about thirty cases are reported till date in the Western literature. However, OMC is classified by Talamonti et al. into small, large, and giant categories with respective diameters were upto 5 cm in small, large with 5–9 cm, and giant with >9 cm. 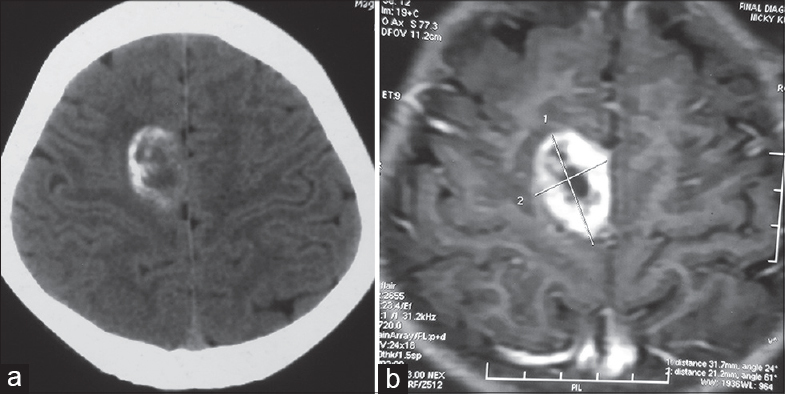 Usually the size of OMC progressively increases as raised intracranial pressure leads to compensatory cerebrospinal fluid escape into sac with the growth of children. 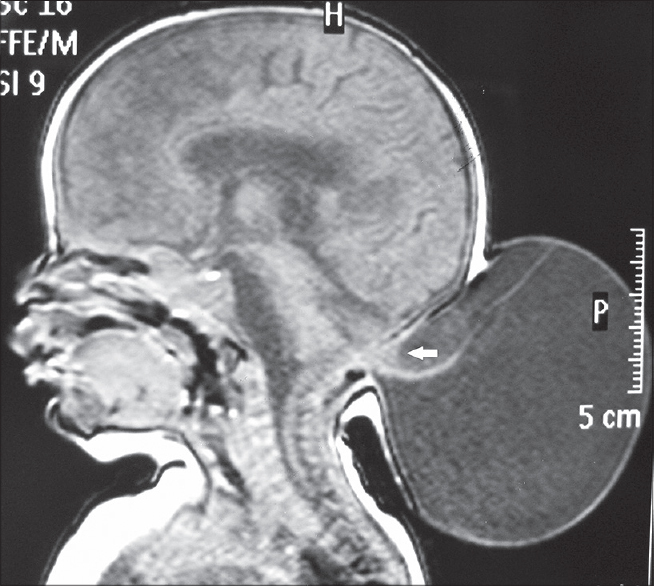 Authors report an interesting case of an 18-month-old female child with extra-gigantic OMC, whose size was almost same since birth, representing the first case of its kind, who underwent successful surgical repair. 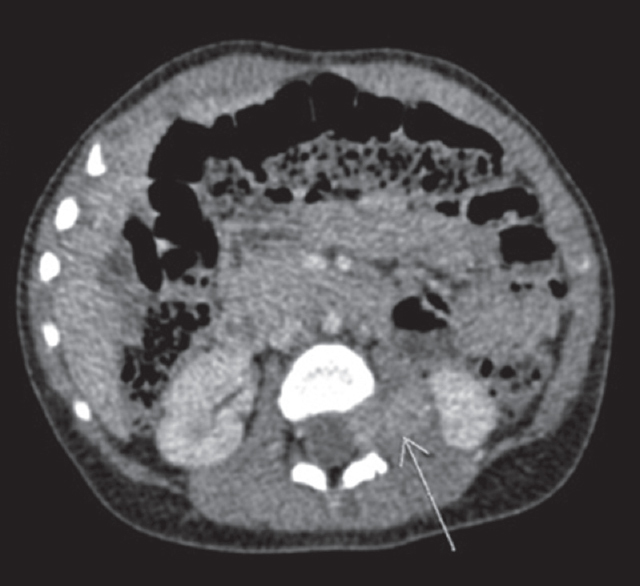 Clinical presentation, radiological features, and surgical management options in literature are reviewed briefly for this rare disease association. Central neurocytomas are slow-growing primary brain tumors of neuronal origin having a predilection to arise mostly in the lateral ventricles. We report a case of a 9-year-old girl who presented with headache and vomiting of 1-month duration. Her magnetic resonance imaging was suggestive of central neurocytoma of the third ventricle and was surgically managed, and tumor tissue was sent for histopathology and immunohistochemistry which confirmed the diagnosis. Primitive neuroectodermal tumors (PNETs) are aggressive childhood malignancies and are difficult to treat. Primary intraspinal PNETs are rare. These patients have poor prognosis with short survival time even after surgery and chemoradiation. As there are no standard guidelines exist for the management of these tumors, a multidisciplinary approach has been employed with varying success. According to the review of literature, only few cases of primary intraspinal extradural PNETs have been reported. Herein, author has described a case of intraspinal, extradural PNET. Scurvy usually presents with tender and painful limbs, swelling of joints, gum bleeding, poor wound healing, and muscle weakness. Here, we report a case of 5-year-old child with global developmental delay who presented with soft swelling of the head over scalp and protrusion of the left eye with extremely irritability. Neuroimaging was suggestive of diffuse extensive soft-tissue swelling involving the entire scalp with large necrotic collections with mild proptosis of the left orbit. It is not mentioned elsewhere, so we are giving name to this magnetic resonance imaging finding as “headband” sign or “turban” sign. 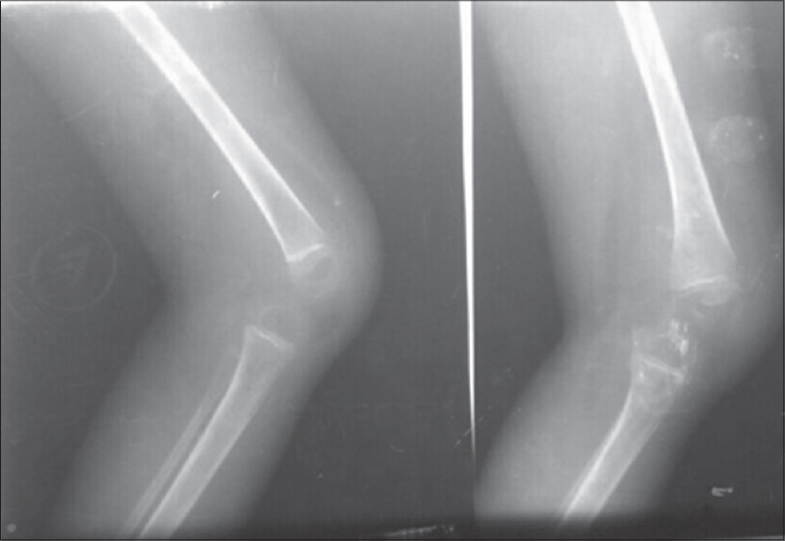 Russell–Silver syndrome is a rare heterogeneous disorder mainly characterized by intrauterine and postnatal growth retardation, craniofacial disproportion, clinodactyly, variation in urogenital development, and skeletal asymmetry. 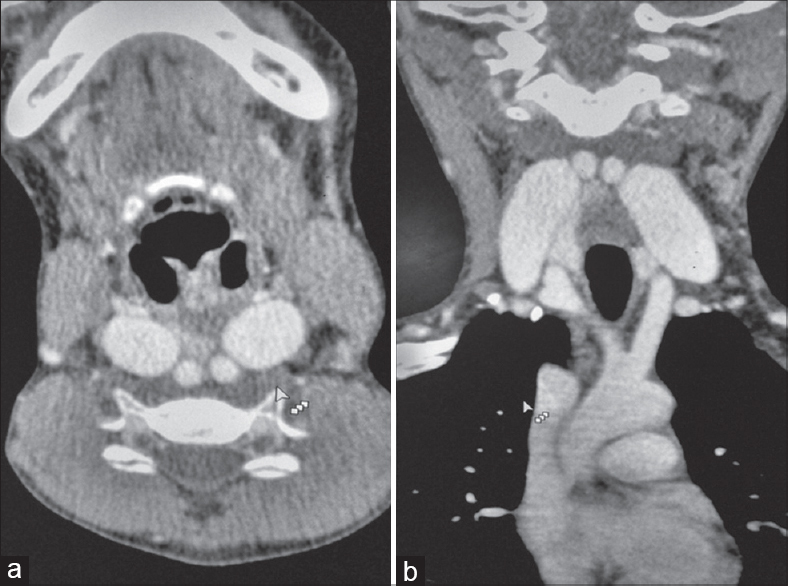 It is rare to come across tethered cord-associated Russell–Silver syndrome. 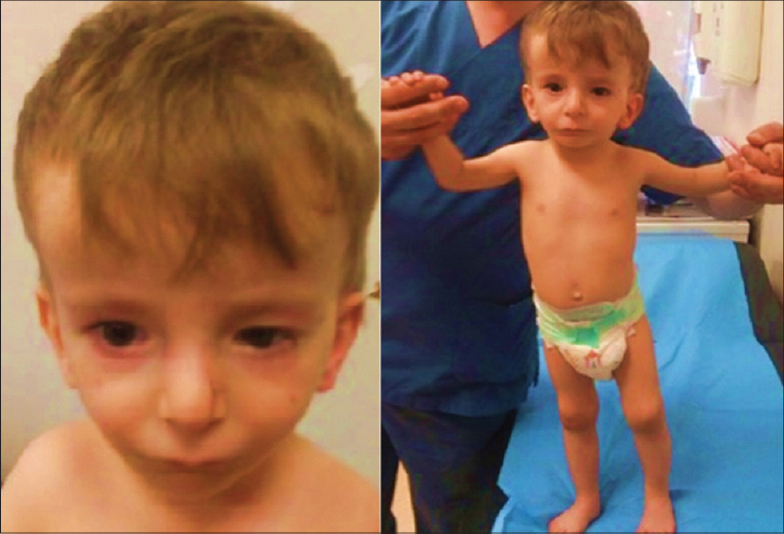 We report a rare case of Russell–Silver syndrome associated with low conus medullaris in a 2-year-old patient with demonstrative phenotype. Magnetic resonance imaging indicated a low conus medullaris at the inferior border of the L3 vertebral body. Urodynamic study revealed detrusor-sphincter dyssynergia and detrusor overactivity. A decision to follow-up the patient was made because of the suspicion of tethered cord syndrome. Even though tethered cord syndrome is not a common finding in Russell–Silver syndrome, it is important to consider tethered cord syndrome to avoid scoliosis and other long-term complications. Spontaneous chronic subdural hematoma (CSH) in infants is extremely rare. A very limited number of cases are known and reported in literature. The clinical presentation can be myriad varying from asymptomatic cases to gross neurological deficits. We report a case of a 3-month-old child who presented to us with repeated episodes of focal seizures of the left upper and lower limb of 1 month duration. 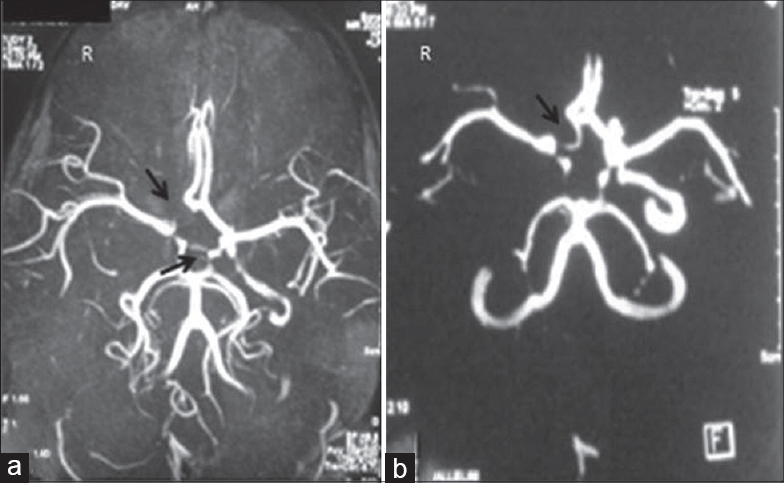 Subsequent imaging revealed bilateral CSH (right > left) with left internal carotid artery infarct and midline shift to left by 8 mm. The child improved following burr hole evacuation of the right-sided CSH. The management of such case and a brief review of literature are discussed. Childhood-onset epilepsy has a varied presentation and may have different etiological factors. A multiaxial diagnostic approach should be used before making treatment and management decisions for any individual patient. It is widely accepted that distinction among primary psychiatric disorders, epilepsy, and nonepileptic seizures is a challenge for physicians. 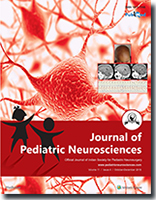 This case series demonstrated the identification of three atypical presentations of seizures in children on the basis of detailed history taking and electroencephalogram findings, despite having normal findings in neurological examination and magnetic resonance imaging. We report three rare cases of atypical presentation in epilepsy in patients with symptoms of episodic hallucinations, rage attacks, and secondary enuresis. Clinically, the diagnosis of epilepsy can be strengthened by paying sufficient attention to detailed history and symptom spectrum of partial epilepsy. The opsoclonus-myoclonus ataxia syndrome (OMAS) also called “Kinsbourne syndrome” or “dancing eye syndrome” is a rare but serious disorder characterized by opsoclonus, myoclonus, and ataxia, along with extreme irritability and behavioural changes. Data on its epidemiology, clinical features, and outcome are limited worldwide. The aim of the study was to evaluate the clinical profile and outcome of children with OMAS. A retrospective data of all children presented to Pediatric oncology clinic with a diagnosis of opsoclonus-myoclonus from 2013 to 2016 were collected. 6 patients with a diagnosis of OMAS were presented over a 4-year period. All 6 cases had paraneoplastic etiology. All Children had good outcome without any relapse. Paraneoplastic opsoclonus myoclonus had a good outcome in our experience.